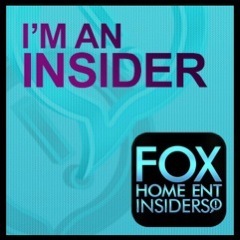 I received complimentary tickets in exchange for sharing this information and my honest opinion. 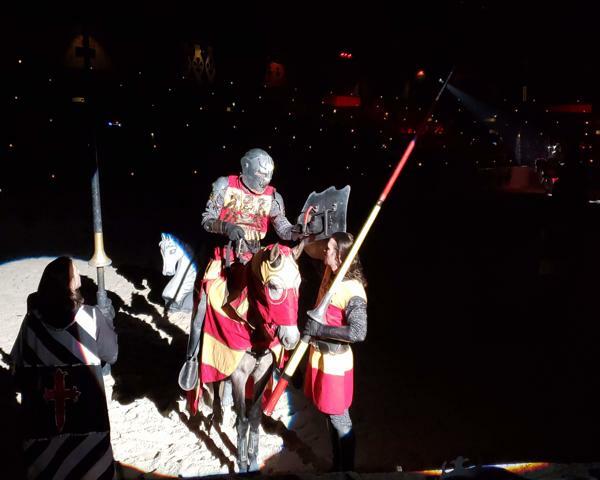 My family and I have been to Medieval Times numerous times and every time we go it is such a fun experience. My kids look forward to the show and most of all the food! 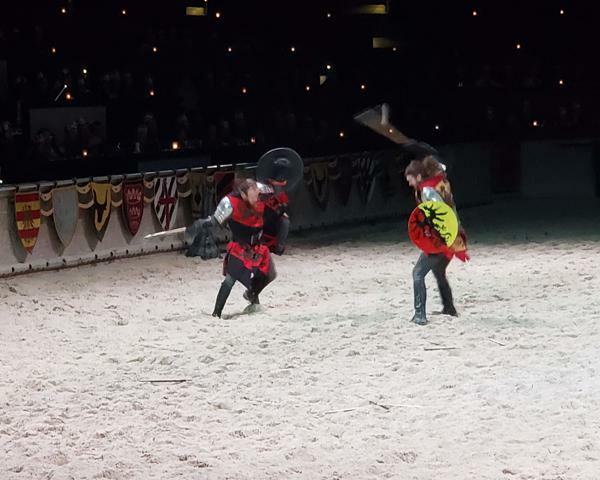 So what makes Medieval Times worth checking out? 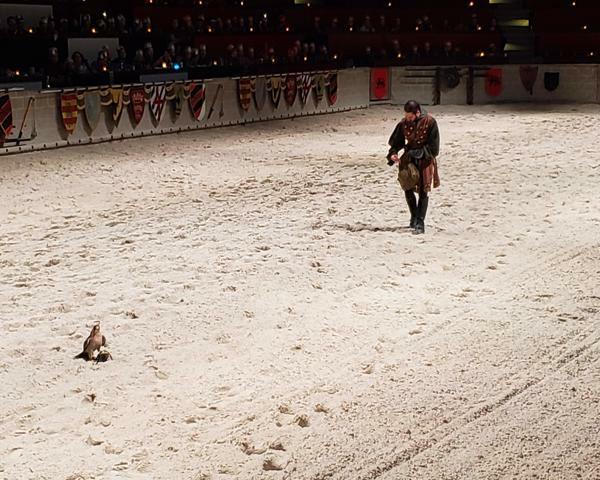 There is a flying bird that is trained to fly around the arena. 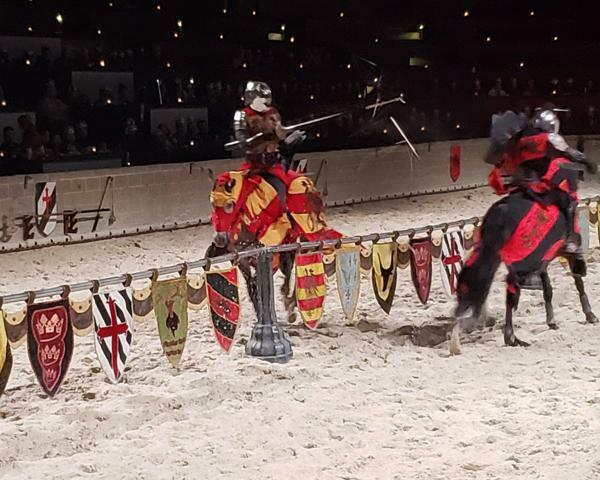 There is jousting with real weapons! Yeah sparks will fly! There are competitions where the knights are on horses and they have to do various medieval competitions. There will be a winner – will it be your knight? We love cheering on our knight! A Queen leads the ceremony! This was actually just changed last year from a King who lead Medieval Times for 34 times! There is a torture chamber to check out! For an additional $2 there is a torture chamber you can walk through with various contraptions and facts to read. There are no bad seats! You will sit around the arena and we have sat everywhere I feel like, never not being able to enjoy the show. You are served right in your seat by a wench who will bring you a drink (1 refill), your dinner and your dessert. You can also purchase alcoholic drinks at an additional cost. 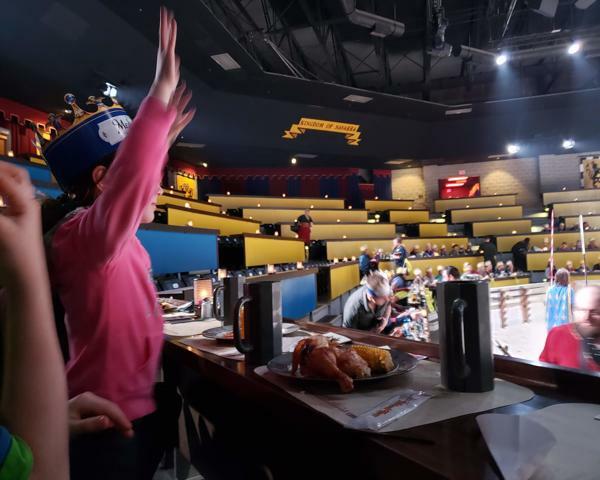 Speaking of dinner, your dinner – Medieval Times’ noble guests feast on garlic bread, tomato bisque soup, roasted chicken, sweet buttered corn, herb-basted potatoes, the dessert of the Castle, coffee and two rounds of select beverages. There is also a Vegetarian option available. 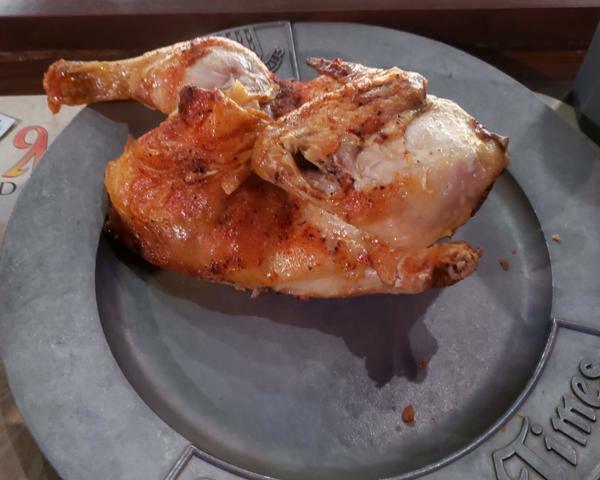 Also, two things to note on the meals: 1) there are no kids meals, they get the same thing adults get and 2) you do not get silverware but rather eat like they did back in Medieval Times! 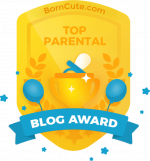 We actually bring silverware with us as my kids prefer it! The price may seem high at first but there are usually coupons you can find and remember the price includes dinner and a 2-hour show. It is a great place for special occasions or just because! 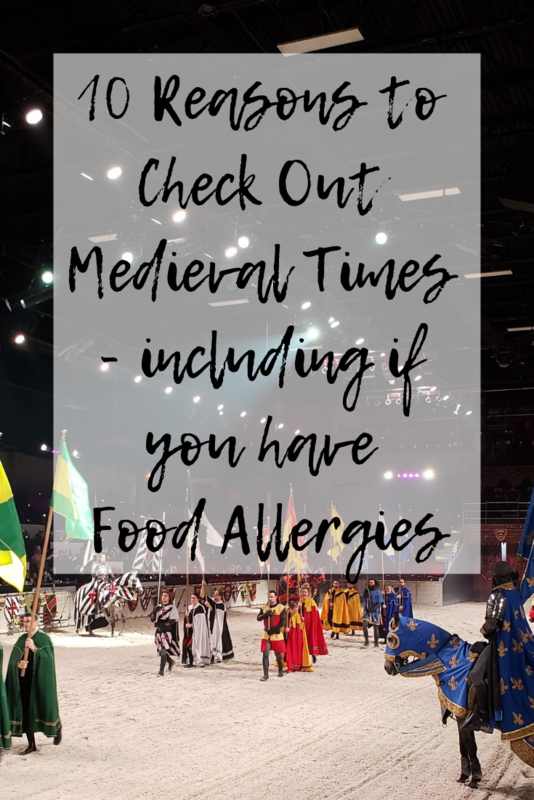 I also wanted to mention about food allergies at Medieval Times. My son has severe food allergies – eggs, peanuts, tree nuts and shellfish – and he was able to enjoy the meal! We did switch out the dessert for a lemonade ice and was told the garlic bread was not safe but otherwise, everything was safe. Our server was not shocked when I asked about allergens and knew on the top of her head what was safe, which is comforting when you get a server who understands food allergies. 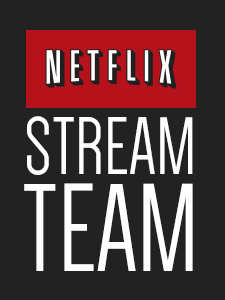 Obviously, it is always important to check with your server as things do change. 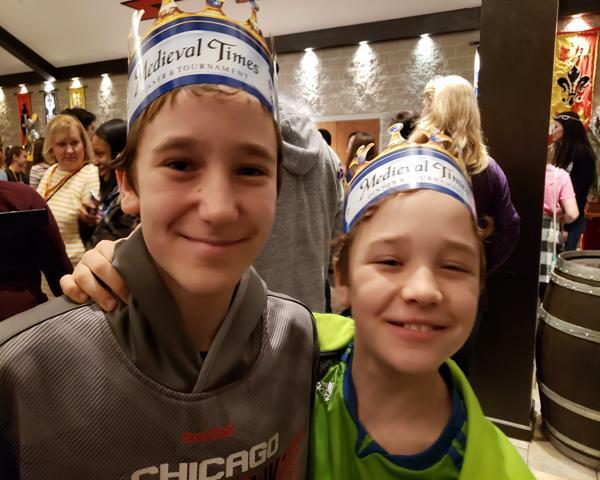 Check out our local Chicago Medieval Times castle for an experience your family won’t soon forget! There are currently nine castles in total: Kissimmee, FL, Buena Park, CA, Schaumburg, IL., Hanover, MD., Lyndhurst, NJ, Myrtle Beach, SC, Dallas, TX, Lawrenceville, GA., and Toronto, ON. Tickets for any of these locations can be purchased here. Love going to Medival Times. Always a good time there. We’ve been to the New Jersey castle. So much fun!